Caroling by the Grosse Pointe South Choir. Warming fires and s'mores provided by the City's Parks and Recreation Department. Complimentary hot chocolate provided by the Grosse Pointe Boat Club. Complimentary Coney Dogs provided by Mike Muir and the Harvard Grill. 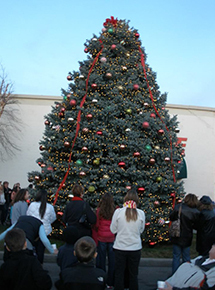 Tree Decorated by the Grosse Pointe Foundation.